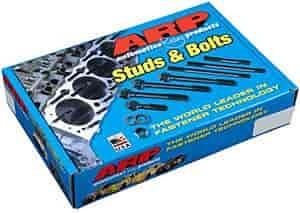 ARP's High-Performance Series Head Bolt Kits are available with a reduced wrenching hex or 12-point and wide area flanged head that eliminates the need for valve train removal to facilitate cylinder head retorquing. All High-Performance Series bolts are 180,000 psi tensile strength, which is 15% stronger than Grade 8 hardware. These kits come complete with hardened parallel-ground washers. Also available in Professional Series Head Bolt Kits.